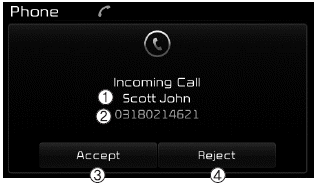 Answering a call with a Bluetooth® Wireless Technology device connected will display the following screen. When an incoming call pop-up is displayed, most Audio and SETUP mode features are disabled. Only the call volume will operate. The telephone number may not be properly displayed in some mobile phones. 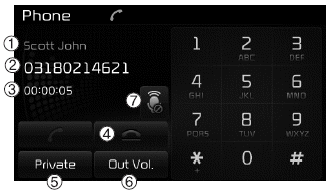 When a call is answered with the mobile phone, the call mode will automatically revert to Private mode. If the mic is muted, the other party will not be able to hear your voice.